Welcome to the Erndell estate, an exquisitely crafted Canadian spruce masterpiece situated atop 89+ acres of paradise. 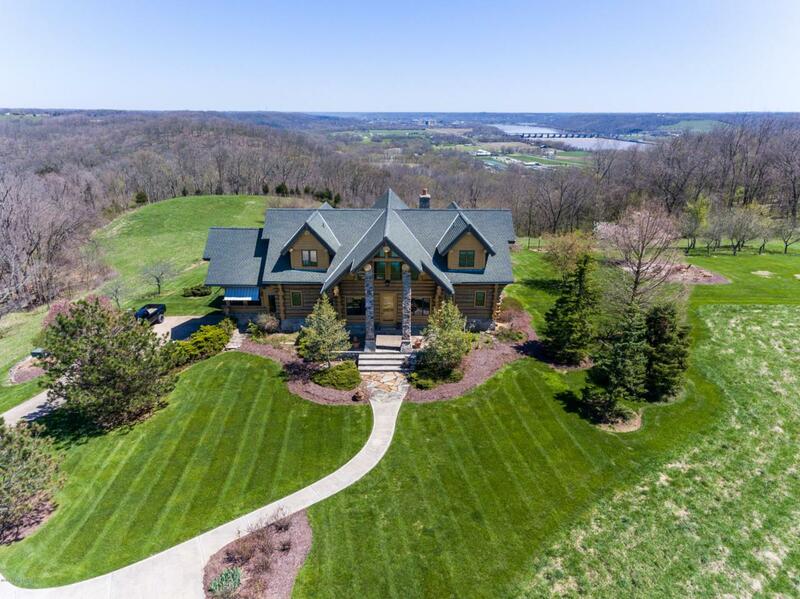 The grand covered porch beckons you into a stunning open great room with a vaulted log beam and cedar ceiling, a gorgeous stone fireplace, and jaw-dropping views of the rolling land, Ohio River, Markland Dam. The extensive chef's kitchen features a Viking Stove and griddle, granite island/bar, breakfast nook with built-in bay window seating, and a separate room for storage and wine chilling. Off the kitchen is a huge enclosed porch with a vaulted ceiling and stone floors, exiting to a massive deck with 360-degree views, perfect for entertaining and relaxing. The first floor master bedroom is an oasis in itself. Enjoy a private balcony, walk-in closet, and a large bathroomUpstairs there is an office with a 360 view of the land. In addition, there are two bedrooms with private baths. The walk out lower level features a family room with a fireplace, a full bath, guest bedroom, a room currently being used as storage space, lots of extra storage along with the 2 car garage. There is a 4 stall horse barn with electric, water and additional storage along with two equipment buildings. The pond brimming with catfish, bird houses awaiting the 3 martin couples visiting yearly adds to this deer hunters paradise (Top Trophy Deer in Switzerland Co.)! The orchards, fire pit, and gazebo add to this beautiful retreat from the world!. Hurry! Words can barely capture what this space has to offer. Come see for yourself! Agent Remarks: The propane tank is owned. Ferrell Gas is the servicing company. The heat pump, electric box along with water heaters have been replaced. The decking around the home has been replaced and the railing on the master and other rooms will be installed. There is a transferable lifetime warranty for waterproofing of the basement.